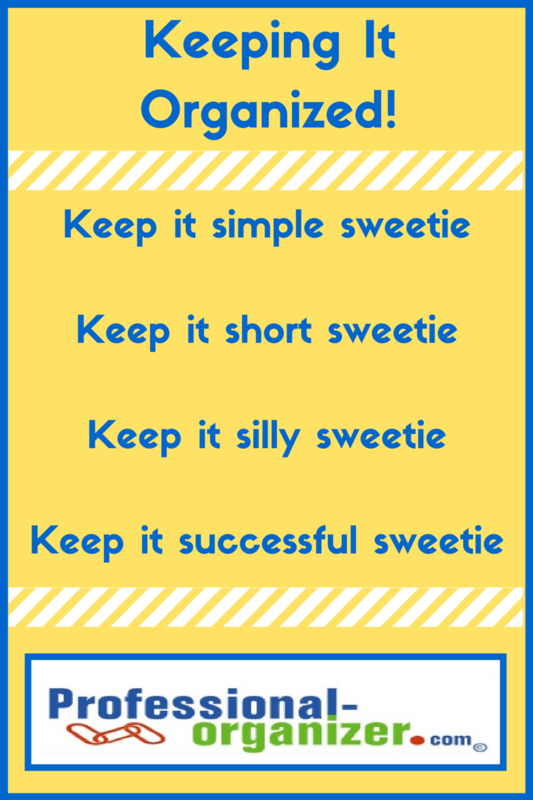 Keeping your life organized can be summed up with the adage, Keep It Simple Sweetie. Here’s how! 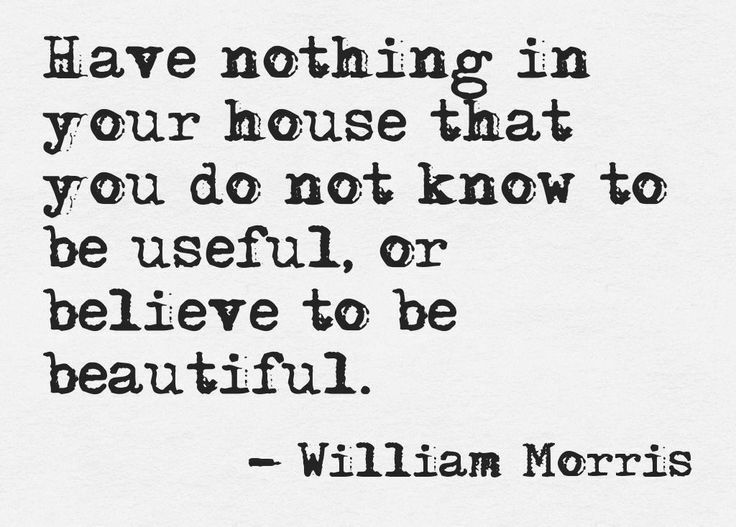 Simple, easy, routine steps make your home and your life organized. Keeping clear about what items, activities and connections are your priorities make life simpler. Grouping like items together and sorted makes for easy organizing. Choose categories that work for you, label the groups and do a small amount of sorting. After sorting, distribute the items to where they belong. Work in short bursts to get organized. Work in small spaces to get motivated for more organizing. Maintain your organization with a quick daily pick up time for yourself and your family. Add fun to your organizing. Simple silliness makes it easier to organize. Silly includes hosting a laundry party in the living room with music, cleaning the kitchen together while singing, or listening to Mary Poppins music “A Spoonful of Sugar helps the medicine go down” while picking up the toys. 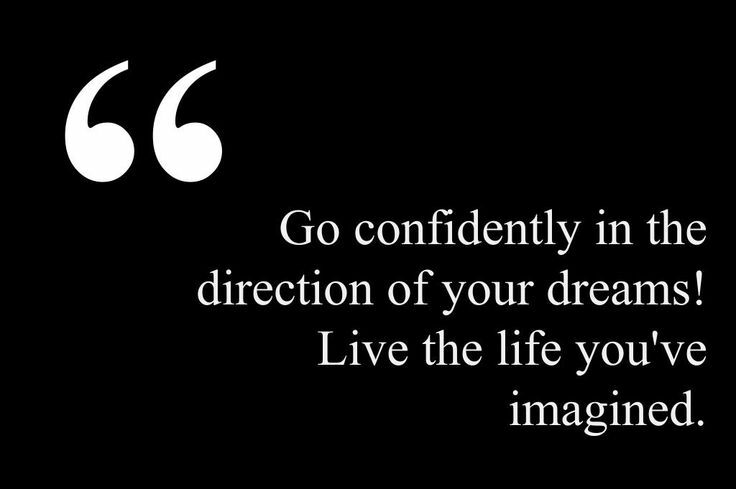 Keep it positive and think of your successes. Each success leads you on to creating an organized lifestyle. Disclosure: I am affiliate for many of the products and services that I recommend. When you click on the link on my site and purchase the product being offered I will receive a percentage of that purchase, at no extra cost to you. If you feel uncomfortable, please go directly to the site for purchase. Staying organized on the go is easy with this versatile zipper pouch. We are all busy with lots of travel, work away from the office, and other commitments. The Kate Spade zipper pouch is functional and fun for a variety of purposes. Keep organized on the go by filling your pouch with pens, pencils, scissors and tape for an anywhere office. Travel with sample size toiletries in your overnight bag with this pouch. Your zipper pouch can keep your cords and technology together between work sites. The pouch is perfect for makeup in your purse. Simply consolidate all your lipsticks, eye makeup and base to carry to and from work or play. And what could be cuter! I love the eyeglass theme because of its sophistication! You are well prepared for any event with this. The month of February is all about hearts, flowers, candy and love. There’s a lot to love about organizing and productivity! Organizing is a gift you give yourself and a gift to others. In the book, The Five Love Languages, Gary Chapman refers to as gifts of service and gifts of quality time. An “act of service” is doing something for another person as an expression of love. A “gift of quality time” is spending time together. A gift of organizing is a small act that makes a big emotional impact to us, to our colleagues and to our family. Share a little (organizing) love this month. 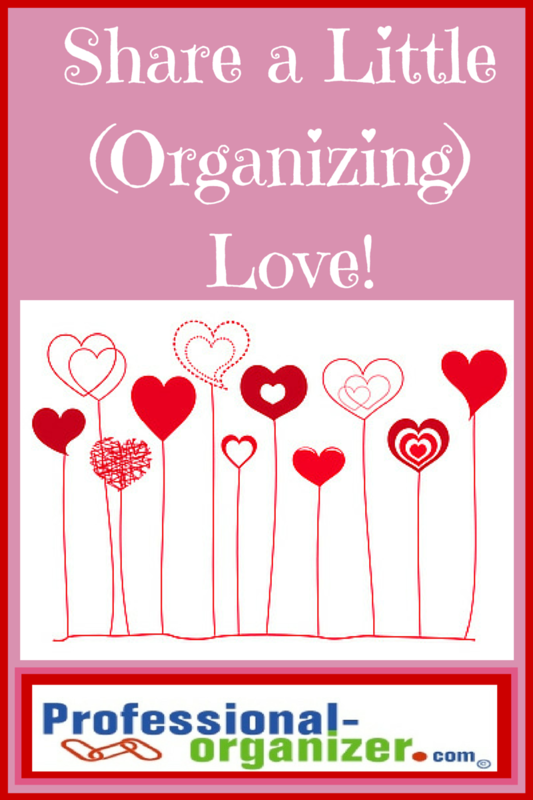 Here’s a small sampling of these ways to get organized and share some organizing love. Family dinner time together is often a shared act of love. It’s a gift of service for those who prepare the meal and clean up and a gift of quality time together. Start with an easy meal plan and use a list or grocery app. Organize and label your pantry so everyone knows what’s available and it’s easy to make dinner. Partner with a family member to make dinner and clean up together. I love the FamilyDinnerProject.org to find easy meals and table topics. There are many acts of service as part of organizing. Here’s some gifts of love to do. Put away another family member’s laundry for them. Do one of your family chores for someone. We all love it when we have one less thing to do and that someone has helped us do something hard to do. What small gift, like unloading the dishwasher or vacuuming the car, can you do that will make your family or friend feel loved? Our blessing others with our goods is an act of love. In the book, The Life Changing Magic of Tidying Up, Marie Kondo encourages us to keep only what “sparks joy.” Marie is sharing to keep only what we love. Take donations to a local charity with your family and see together the impact it can make. Our community is blessed to have so many ways to help others. Organizing can be quality time together and lead to better productivity. Work together with a family member or friend to declutter a space. Listen to their ideas and help them make decisions and know what to let go. Or you can work alongside your friend or family member as a “body double.” My clients share stories that when they are organizing, just having another person in the space tethers them to the task, helps them think through ideas and helps them get organized. Set aside time each day during homework time with your kids. 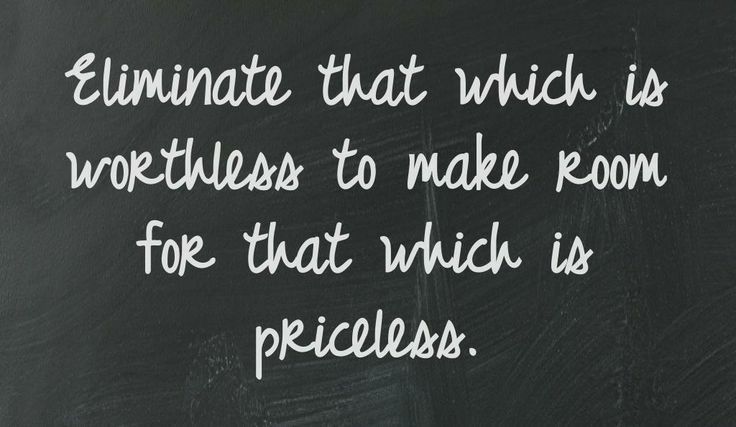 While they are doing their work, you can work on your paper work and administrative tasks. Share your gift of service by working on a family project together. Work together on a service project for a local philanthropy. When you model acts of service, you are sharing important values and giving back to our community. The true gift of organizing is the connection you create with your family and friends. Just as important as words of love, these acts of love make an impact every day, not just on Valentine’s Day. Your little (organizing) love lasts all year! What kind of (organizing) love do you share? At this time of year I like to do an annual archive session for files. Not only does it open up space in your files, it keeps your files from being out of date and unused. Your files are meant for reference and retrieval. Your archive files are for long term storage. Files are kept in file drawers, while archive files can be kept in plastic file totes (affiliate link Tax time) and stored in less accessible spots (such as the back of a closet or the attic.) 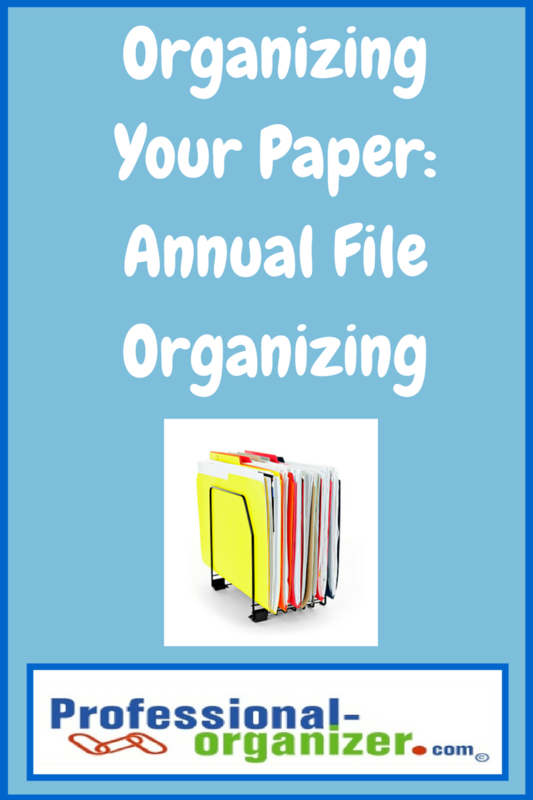 It’s easiest to archive by year, so January is a great time for this annual file organizing. Start with a plastic file box with hanging files. Remove papers from your files and clip together with a binder clip. Categories of papers to remove include: credit card statements, utilities, and medical explanations of benefits. Place tax related papers in folder and label it TAXES 20XX. Place it in an easy to access spot for later this month. Label the exterior of the bin with that year. If you find papers from previous years, create a box for each and label it with the previous year, one year per box. For tax purposes you want to go back 7 years. For other records, you can decide what works best for your needs. Voila! Your files have space and you can start the new year ready to file! Don’t miss any organizing tips! Join my monthly newsletter list! It’s that time again! It’s easy to procrastinate. Incoming mail shouts out “Important Tax Papers Enclosed.” There’s no avoiding it, it’s time to get organized for your taxes. It’s better in baby steps with these tax time tips. Even before your 1099 papers arrive, start a master file using an expanding accordion file (affiliate link) or file folders. Label the files with the important tax categories –W-2 information, interest and dividend income, capital gains and losses, charitable donations, medical and dental expenses, deductible business expenses, and miscellaneous deductions (educational expenses, safe deposit boxes, financial planning). Even before your papers arrive, this file will be their “home” and papers will not get lost! And to prepare for the current year, begin a master file for incoming documents for the current year, so you will not have to search for them at this time next year. Not sure what papers you will need? Turbo Tax has a list for you! At the beginning of February, mark your calendar for a 2 hour tax session with yourself! Go through your checkbook, bank statement and files to find important items to copy for accounting purposes. Three weeks later, mark another 2 hour tax session to wrap up those loose ends and file your documents in your master file. If you use an accountant, you are ready to send in your papers. If you file yourself, break your filing sessions into manageable chunks like 2 hour sessions too! You can always break these sessions into one hour segments too. Most importantly marking these on your calendar commits you to work. So much has changed about paper and the IRS. You can use scanned documents as records for your tax deductions. According to the IRS, “The electronic storage system must also index, store, preserve, retrieve, and reproduce the electronically stored books and records.” You can scan any kind of paper and receipts as back up documentation. If you choose to scan, be sure you back up your documents and create an online file system that you can easily use and access. There are lots of other ways technology can help. 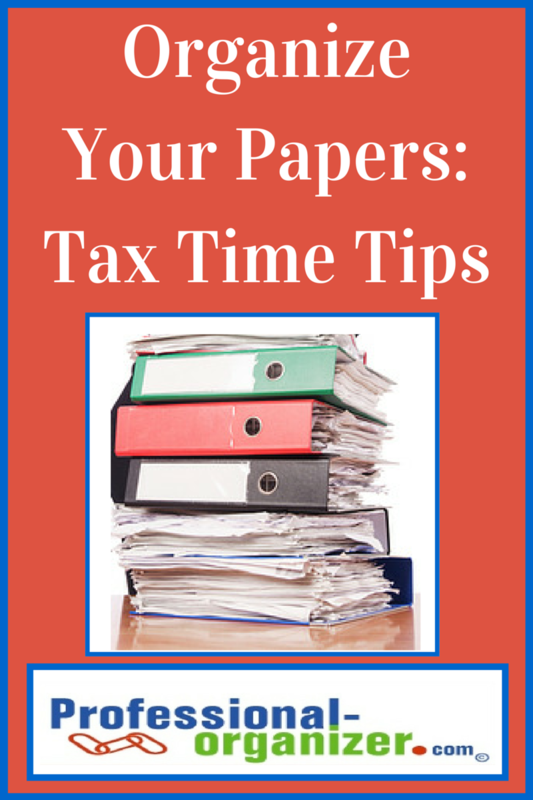 Can’t find your most important tax papers? Look online for your property tax payments and mortgage interest expense. It’s easy to locate these records on your mortgage or banking websites. Medical expenses are easy to track online at your medical provider’s website. Need values for your donations? Click online at TurboTax Its deductible Online Charity Tracker. It’s a free, easy to use online tracker for your donations throughout the year. File electronically with the IRS is the way to go. Upon receipt, you will receive confirmation. Keep the confirmation with your tax papers, just in case. 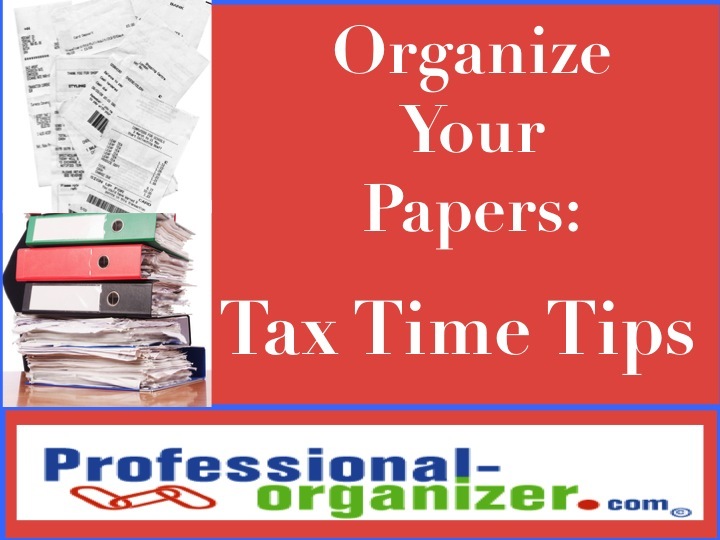 Tax time and tax preparation is much easier by being organized. After you are done, treat yourself to a little reward! Need help with your tax preparation? Let me assist you. Enjoy a little time away from your taxes. Check out my pinterest pages Warm Winter Fun!